I'm really into soups this season. I can't get enough soup. Chicken. Vegetable. Purees. Matzah Ball. Chili. I think I'm even ready for some stew too. I always say I enjoy making soup far more than I enjoy eating it. I love being able to make something from almost nothing. That being said, I often feel like soup either isn't satisfying enough (like a sandwich or hamburger might be) or that the soup just lasts forever. I can't stand left-overs beyond 2 times, and even that's pushing it for me. Maybe it's the harsh cold winter we are having with this Polar Vortex. Or it's the need for nourishment and nurturing my body desires from hysterectomy recovery. Whatever this new-found craving for soup is, I'm loving it. Because my body is low in iron (I'm recovering from a severe bout of anemia, not helped by the blood loss I experienced during my surgery. I had 2 transfusions!) I crave red meat and anything that has iron in it. Look out! I might start licking the cast iron skillets next! 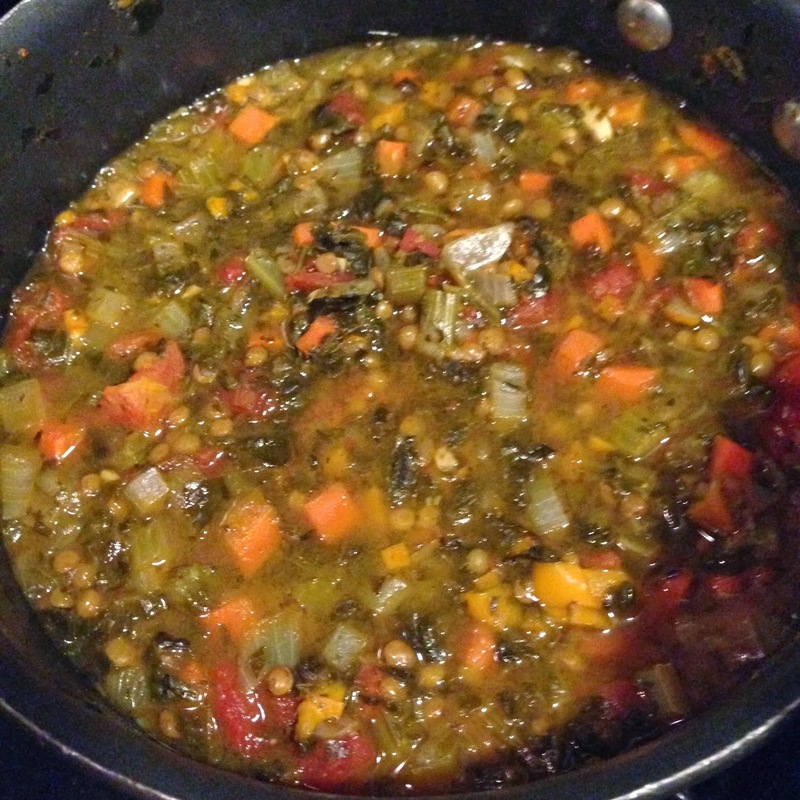 I made a batch of hearty lentil vegetable soup, rich in iron and full of healthy nutrients from a variety of veggies. I added in diced tomatoes and spinach too, upping the lycopene and iron stores. Working from nothing, I made a decent pot of soup that is not only satisfying but it was a small enough batch that I won't be looking at the left-overs for too long. Wash and prep all the vegetables. Keep each separated. Use a 4 quart sauce pot, and heat the oil in the pan over medium-high heat until the oil shimmers. Add in the diced onions, carrots and celery and sweat for 5 to 10 minutes. As the vegetables begin to release their liquid, you want the water to evaporate and the vegetables to start to take on some colour. The onions and carrots should begin to slightly caramelize. Add in the diced bell peppers and sauté another 5 minutes, then add in the minced garlic and sauté for 1 minute more. Next, add in the lentils and stir in the dried thyme and parsley; then pour in 4 cups of cold water (or more to cover the vegetables by 1 inch). Bring the mixture to a boil, then reduce heat down to a simmer. Simmer the soup for about 45 minutes, or until the lentils are tender but not mushy and the water has been almost but not compleley absorbed. If there isn't enough liquid in the pot, add in more by 1/2 cup at a time. If it's too watery, let the mixture cook a bit longer at a higher heat to evaporate some of the water. After the lentils are tender, add in the can of diced tomatoes and their juices and the chopped frozen spinach. Stir to incorporate and bring the soup back to a low boil. Cook the soup for another 10 to 15 minutes. Season the soup with salt and freshly ground pepper and a tablespoon or more of the balsamic vinegar. Adjust the seasonings as needed, being cautious to not add in too much salt or oil. The soup will taste best once it's had a chance to sit; it will be dynamite the next day, after it's cooled and all the flavors have married and melded. Serve hot. Serves 4-6. Will hold for up to 4 days tightly covered and refrigerated, or freeze for up to 2 months. Yum! Can't wait to add this one to my soup collection! Thanks G-Man! I hope you like it. And I love that it requires no stock, you make the veg stock as you cook the soup. The way to get extra flavor in it w/out adding fat or salt is by coaxing out flavors by sweating the veggies and caramelizing them a bit. HOLLY! I totally think adding leeks and/or potatoes would make this soup be even better! I'll have to keep some leeks on had like that too - what a great idea! And yes, I am feeling so much better. It's like I turned a corner at 6 weeks. It's almost as though it never happened. almost!